All transactions are safe and secure with a reliable history in online purchasing behind each of our associates. 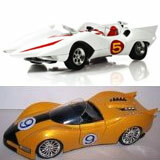 Buy the Speed Racer Diecast Cars - Mach 5 and Shooting Star Toy Cars to own Speed Racer clothing and merchandise. Burn some rubber with these Speed Racer diecast replica cars that are ideal for fans both young and old. Choose the popular 1:64 scale Speed Racer Hot Wheels diecast with saw blades or opt for the larger 1:18 scale replica model. Racer X Shooting Star diecast toy cars are also available, in addition to action figures. In addition to the Speed Racer Diecast Cars - Mach 5 and Shooting Star Toy Cars above, browse the Speed Racer Clothing Gallery for more apparel like men's and women's clothes, kids shirts or hoodies.